Dubai, UAE, April 12, 2018: The SS2018 men's and women's watch collection celebrates Tommy Hilfiger's love of motor sports, where speed and immediacy fuse with a touch of vintage nostalgia. Tommy heritage gets an iconic twist in this sport watch for him. 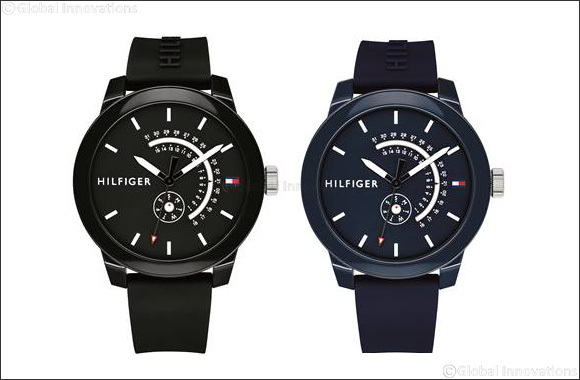 The thermoplastic 44mm case features a multifunction dial with day and date openings, accented with the Tommy Hilfiger logo flag at 3 o'clock. The collection comes in brown or black leather straps and black/red/white/blue silicone straps with signature debossed Hilfiger logo. The collection is priced at AED 545 and is available across all Hour Choice Stores in UAE.